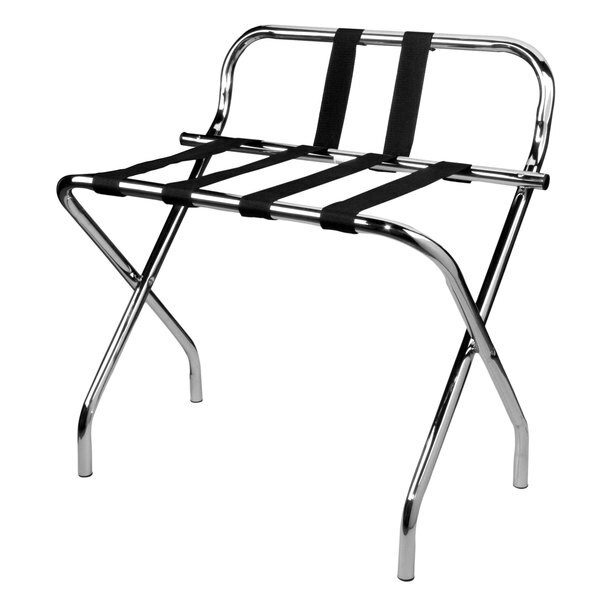 This Lancaster Table & Seating chrome folding luggage rack with wall guard is great for holding suitcases at your hotel, motel, resort, or convention center. Its solid metal construction creates a stylish modern look while also providing durability and sturdiness. This rack keeps guests from storing luggage on a chair, couch, bed, or the floor. This frees up more space and makes it easier for staff to clean guests' rooms. This product features a modern chrome finish and smooth, curved edges for maximum visual appeal. Rubber feet protect your floors from scratches and scuffing, and contribute to stability and slip resistance of this rack. Its metal construction also increases sturdiness and support. The additional back to this frame means your guests can pile their luggage atop it without worrying about it falling off, even when the rack is not propped up against a wall. It also protects the walls from being dented and scratched by luggage. This luggage rack can easily be folded flat and stowed in crowded closets or behind your front desk. A convenience for both you and your guests, this luggage rack is a great addition to your business. Height (excluding guard): 21 1/2"
Height (including guard): 28 3/4"